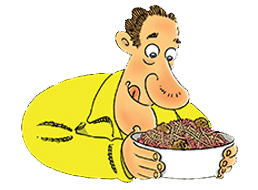 Nana’s secrets for keeping a hungry family happy live on in our baked pastas. Want to try something a little different than pizza? • Famiglia serves 4-6 • Medio serves 1-2. All of our pastas are baked under a wonderful layer of mozzarella for your best taste experience. 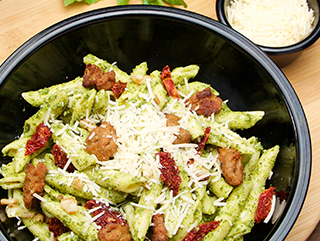 A house special… A ton of pasta, our spicy Italian sausage & sun-dried tomatoes blanketed in our basil, garlic & olive-oil pesto. We bake it with Nana’s tender care & then top this amazing meal with asiago, romano & parmesan cheeses & baked under mozzarella. This is not a saucy pasta, but a pesto pasta! Fenomenale! A Company original! 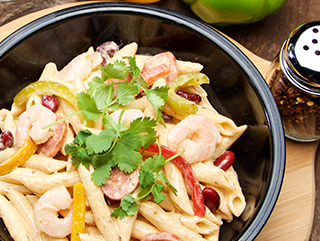 Like our Louisiana pie: creamy Cajun Alfredo & penne, succulent shrimp, andouille sausage, red beans, plum tomatoes, & multicolored bell peppers. 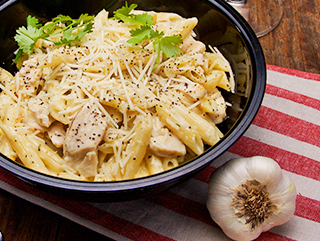 The simplicity of penne; the simplicity of Alfredo. 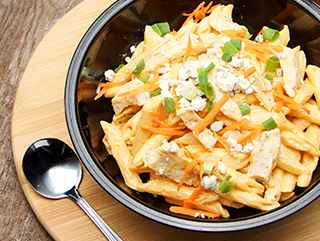 Straight from NY: a creamy Buffalo-spiced Alfredo slathered around al dente penne, green onions & the cool & sweet of shaved carrots compliment the spiced chicken & the flavors of monterey jack & gorgonzola cheeses. You’ve been eating it since you were a kid—& there’s still a little kid in all of us. 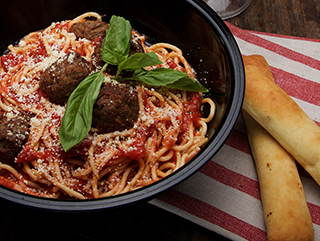 Our best Tuscan marinara sauce & our incredible meatballs, baked Nana’s way, ready for a hungry family. 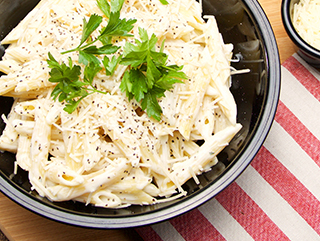 Just like Nana used to make, mild & full of flavor for the nipoti (grandchildren) — our amazing creamycheesy Alfredo sauce together with our garlic chicken, baked under our sweet whole milk mozzarella.